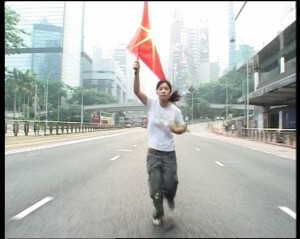 Berlin 1968, a film experiment in the style of Earweard Muybridge, Andy Warhol and the New American Cinema: young men do a relay race passing a red flag in the midst of the traffic along a busy street, the last one carries the flag into City Hall. Inspired by this "study of movement and a symbol", remakes ensue in Stockholm, Sulmona and Hong Kong. Colour Test.6 is a synthesis of these four relays into one film -- the "Colour Test of the Revolution" is carried on, with a prospect in Beijing. Gerd Conradt was born in 1941 in Thuringia. After studying Photography, he started his film career at the German Film & Television Academy (dffb) in Berlin in 1966. After lecturing for about seven years at different Berlin universities, he directed a series of German poems for the Berlin broadcaster SFB. Since this time he has been working as a director and author for documentary films for television and cinema. His films include: About Holger Meins (1982), The Video-Pioneer (1984), TV-Greetings from West to East (1985), Heavy User (1989), Hold Me - Love Me: Tempodrom in Berlin (1995), Dyngyldai (1996), People and Stones (1998), Starbuck - Holger Meins (2001), Mount Ever-Red (2005), The Spree - Symphony of a River (2007), and Colour Test.6 (2008).